Question: In what ways can the G20 support delivery of the SDGs? There are clear complementarities between the G20’s strategic priorities and Agenda 2030. Following the SDG success of New York, and looking ahead to COP 21 in Paris in December, the G20 is well‑placed to add momentum to the global imperative for sustainable development in three areas: spearheading the global recovery, addressing the specific needs of low income and developing countries, and SDG implementation. Pillar One: Enhancing macroeconomic policy coordination and promoting an ambitious structural reform agenda to unleash investment and innovation and unlock productivity. Pillar Two: Renewing trade liberalisation efforts and delivering on trade facilitation commitments to improve efficiency and lower trade costs. OECD work shows that the implementation of the Bali agreement could reduce trade costs by around 15% in developing countries. Pillar Three: Fostering labor mobility, investing in skills and empowering women and girls to achieve their full potential. Pillar Four: Leading climate change mitigation efforts. Let me mention two examples where the G20 has been particularly effective in this regard: food security and infrastructure development. The G20’s actions on food security have created conditions conducive to advancing SDG #2. Three years ago, G20 countries established – with OECD and FAO support – the Agricultural Market Information System (AMIS). By enhancing the transparency of food stocks, AMIS helps countries design policies to reduce food price volatility. In parallel, G20 Chief Agricultural Scientists have discussed ways to increase agricultural productivity. We are now identifying ways to reduce food losses and waste, thereby ensuring more sustainable consumption and production patterns consistent with SDG #13. The importance of modern, efficient and reliable infrastructure investments is a common theme across the SDGs. Such investments are critical enablers for improving connectivity, promoting inclusive growth, supporting environmental sustainability, and inserting developing countries’ SMEs into global value chains. According to our estimates, the total cumulative requirements for global infrastructure investment by 2030 for transport, electricity generation, transmission and distribution, water and telecommunications is approximately 71 trillion U.S. dollars, which amounts to about 3.5% of global GDP forecast over the same period. But better policy frameworks are needed to generate this extra investment. This is an area where the G20 has achieved a lot. For example, at this year’s Summit, the OECD will deliver, jointly with the World Bank Group, a set of indicators to help developing countries design and implement policies to mobilise quality private investment in infrastructure and mitigate risks. Finally, and consistent with the theme of our discussions today, the G20 must play a leading role in implementing the SDGs. G20-OECD work on tax and domestic resource mobilisation is consistent with this role and we should make similar efforts in other areas. 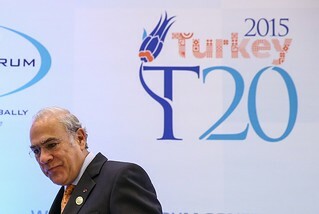 The G20, building on its achievements under Turkey’s Presidency, should further align its actions with the universal and transformative nature of the SDGs, placing sustainable development at the core of its agenda and monitoring implementation. Question: Do the SDGs require a change in mindset vis-à-vis the Millennium Development Goals (MDGs)? We have entered a new era for global development. The MDGs focused on helping the poorest people in the poorest countries: lifting people out of extreme poverty, reducing child mortality, fighting disease epidemics, and building a global partnership for development. These were very noble aims. But the goalposts for development have now shifted. The conventional dichotomies – donors and recipients, North and South, East and West – are losing relevance. The SDGs reflect a global agenda. They will position us, all of us, to address the economic, environmental and social threats of our time. The success of the SDGs depends on national ownership and the capacity of international institutions to coordinate implementation efforts effectively, efficiently and fairly. First, countries must objectively evaluate the sustainability of their own development strategies and take responsibility for the spillover effects of their policies, practices and performance on the rest of the world. Second, we must ensure our collective efforts – through the G20 and international organisations, networks, forums and bodies – are consistent and mutually reinforcing. The G20-OECD Base Erosion and Profit Shifting (BEPS) Project – that seeks to curb tax evasion and avoidance by large corporations – shows how effective solutions to common problems can be developed through coordinated global action. The BEPS outcomes – which I will have the pleasure of presenting to G20 Leaders on Monday – were shaped through extensive engagement and consultation with developed, developing and emerging economies, business and civil society. These outcomes reflect more than three years of intense work and negotiations and illustrate the G20 at its best. BEPS, and the global move towards the automatic exchange of tax information, are game-changers for the international tax architecture. The OECD is committed to forging new pathways to secure a sustainable future for the planet and the world’s people. Deputy Prime Minister Yilmaz, I commend Turkey for prioritising sustainable development across G20 workstreams in 2015 and look forward to continuing this important work under the Chinese Presidency in 2016.